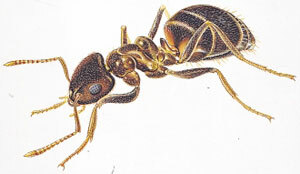 Foraging worker ants cause a nuisance as they travel widely in search of food, following well-defined trails and clustering around the food source. Sweet foods are preferred. In gardens their excavations around plant roots make the soil excessively dry. They will also cultivate greenfly, themselves pests, in order to obtain the sugary honeydew secretions that these aphids produce. On the other hand they can be beneficial as predators of other insects and general scavengers. They are obviously an unpleasant sight and may damage food used for human consumption. Although frequently inaccessible and difficult to destroy, ants’ nests must be eradicated if infestations are to be successfully controlled. The nests of Black ants can be located by following their trails. Potential food sources should be identified and protected from attack. Insecticide treatments can be applied in and around the nest and should aim to ensure that a residual film of insecticide is maintained at strategic points, for example points of entry to buildings, such as doors, windows, ventilators, ducts, and drains. Wall / floor junctions, ant runs and all other harbourages should be treated, using the product according to the label directions. Particular attention should be given to small insignificant cracks which may be major points of entry for the ants. Insecticidal baits too, can be used around the entry points.